These are fine art signed and numbered limited edition giclees on canvas. 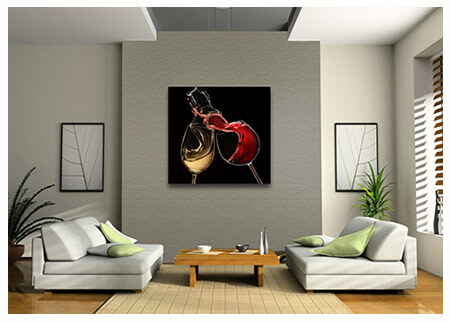 "Original art with WINE as the centerpiece". Think about the ambiance of your store. Restaurants come and go but the survivors offer great food and service along with surroundings reflecting a relaxed lifestyle. 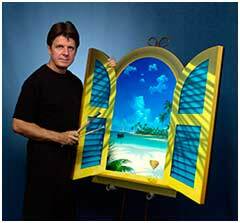 Artist David Miller creates affordable, unique art to help you build your image as a top line destination. Isn't your goal to enhance the diners experience? Davids work will ensure your customers feel at ease and mellow as they enjoy your superior cuisine and exceptional service. A bottle of fine wine is enjoyed by all. 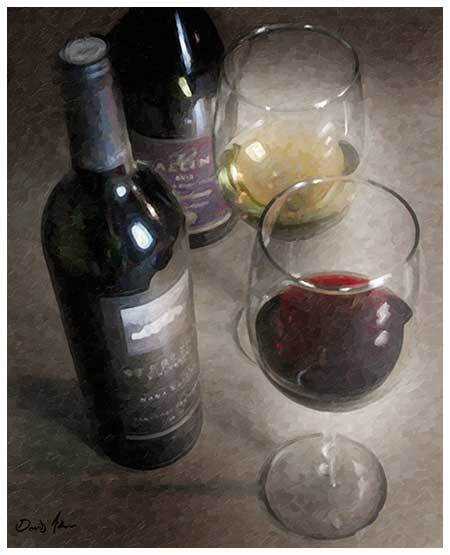 Why not centerpiece wine as your draw and add surroundings that tell the wine story. You will be pleasantly surprised at the conversations and reactions of your guests. And they will return knowing you care about their quality experiences as well as their palate. 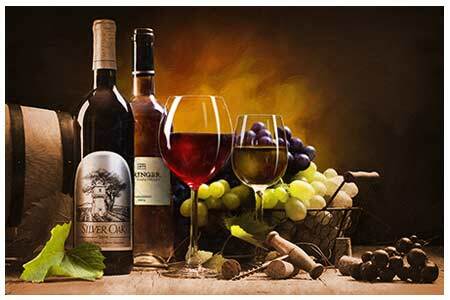 Let David help you become unforgetable as THE wine destination for those who expect more. 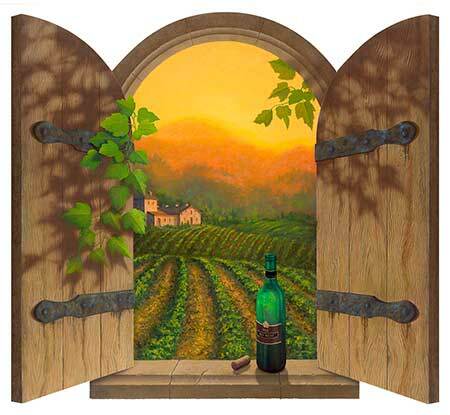 Imagine waking in a cottage in Tuscany or a bungalow in Napa valley. Those dreams can be yours through art. 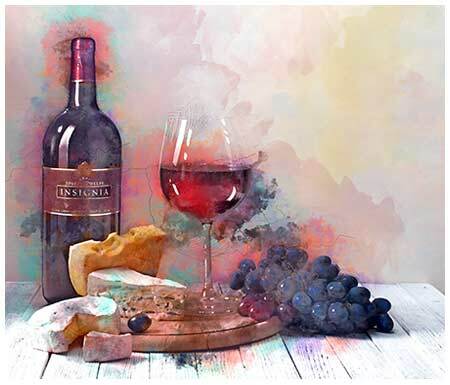 Let yourself be carried away with the wine experience and look deep into this portrait of serenity and the good life. A contemporary piece of art with earth tone colors can add that splash to your special wall. Our high quality printing process produces giclee prints virtually un-distinguishable from the original painting. Giclee prints are commonly found in museums, and art galleries. We use the very best quality canvas, most vivid color palate available and top of the line twelve color printer to ensure every piece maintains the high standards demanded by our customers. Each piece undergoes rigorous quality control checks and is individually hand assembled by our experienced staff ensuring you get the very best available, every time. Date night, where to enjoy this special time. Sensual cuisine, relaxing surroundings. That georgeous wine you remember from last time. You remember the food, wine for 2 and the decor which set you at ease. 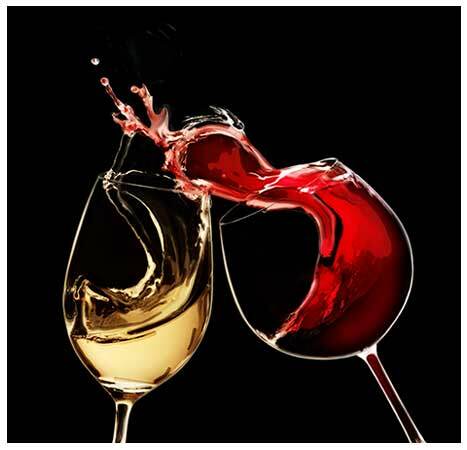 The kiss of the glasses as you toast today. Artist David Miller offers original art meant to invoke these thoughts in your customers. We're not saying the art is what brings them back over and over, but these memorable, unique pieces are well above the usual and will be topics of conversation for your guests ans their friends. Time to tip your glasses and create a date for 2 experience second to none. SEE THE PAINTING ON YOUR WALL BEFORE YOU BUY! Send us a picture of your wall and we will superimpose the painting or paintings you're considering on your wall. Imagine seeing the artwork hanging on your wall before you actually make the purchase.